AAPL – Any hope for 2H16? Analysts now expect AAPL’s 3QFY16 to show revenues off 15% and EPS down 25%, but hitting those numbers would be a pyrrhic victory if management cannot raise enthusiasm for the upcoming iPhone7 and FY17. Expect typical enthusiasm on the call, but nothing concrete enough to move the stock out of its recent range. GOOGL – Upside on clicks and costs. 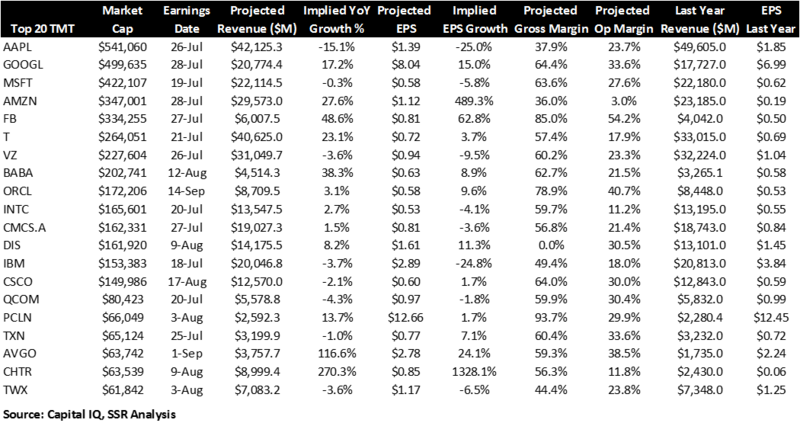 Expectations for GOOGL are good, but not great, with 17% top line and 15% bottom line growth. FX could be a factor, but we expect currency adjusted results to surprise a bit on the strong US ad market and CFO Poorat’s focus on managing expenses. The long term story – leadership in cloud computing and AI – is compelling, and we expect management to talk vision at length. The 18.5x forward P/E looks cheap to us given the vast opportunity for growth. MSFT – The last of the PC/Nokia overhang? Consensus is looking for mostly flat sales (-0.2% YoY), with a 6% hit to EPS this quarter, but projects a return to growth in 1QFY17 on both top and bottom lines. Like most of the tech names, FX will be a speed bump, but we see sales upside for Productivity and Business Cloud (Office 365, Dynamics) and Intelligent Cloud (Azure). Expect aggressive promotion of the LNKD deal (we like it) and MSFT’s AI strategy. We see the 18.8x forward P/E as reasonable given accelerating growth and easy targets for FY2017. AMZN – Just killing it now. The bar is a bit higher – analysts want 27.5% YoY sales growth and EPS a nickel higher than last quarter. With the general bloodletting amongst retailers, the inexorable expansion of Prime, and a much faster than expected enterprise transition to the cloud, we believe AMZN has enough wind at its back to beat again – IF Jeff Bezos cares to beat. With no sign of a big new investment initiative, we think the water’s safe. FB – In the right place at the right time. We believe US ad spending remains up sharply, driven a stronger than expected political spending cycle driving both sales and engagement statistics for FB. The company has a high bar to get over – analysts are looking for very little deceleration off of the huge 52% YoY sales growth posted in 1Q16. We think the strong market and the ongoing shift by ad buyers toward digital will keep FB ahead of consensus. Given the torrid growth, the 26x forward P/E is reasonable, but the stock would be at risk should the trajectory weaken. 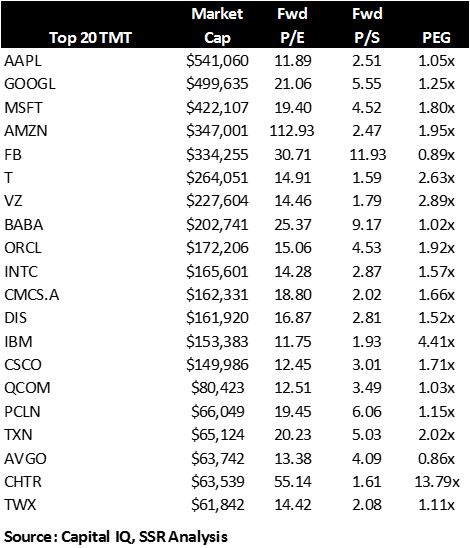 T and VZ – Dividend havens getting pricey. The two big US carriers are each up ~24% YTD, dropping T’s dividend yield below 4.5% and VZ’s to just over 4%. Analysts expect T to deliver about 2% organic growth (after DTV) while VZ sales are projected down by less than 1%. We expect both to report declining post-paid phone subs, with low revenue car and tablet subs generating all of the unit growth. ARPU will be a key number – both carriers are choosing to ignore TMUS’s price provocation, so strong per sub revs are a must. We see ample reason to be concerned, but the results may not be scary enough yet to move the stocks. ORCL – Good read on the enterprise cloud shift. ORCL reported its FY15 4Q #s back in June, seeing its shares jump on surprising cloud SaaS and PaaS growth. Meanwhile, its traditional software and hardware businesses continue on their downward trajectories. We are very skeptical of the company’s ability to maintain long term momentum in the cloud – we believe that it is at a considerable operating cost and performance disadvantage in its data centers – but the results have positive read across for the cloud businesses at AMZN, MSFT and GOOGL. INTC – In at AAPL, then what? INTC has been on a run after announcing a 12K layoff and then winning a piece of the modem business for the iPhone7. While these are undoubtedly good news for shareholders, neither will help for 2Q16, where expectations for a 2.6% rise in revenues in a poor FX environment could be optimistic. Longer term, the 13x forward P/E is fair for a stock that we believe will struggle to deliver more than low single digit growth. CMCSA – Election, Olympics and oligopoly power. Expectations for 2Q16 are modest – 1.5% YoY sales growth and slightly declining earnings – while the Olympics-powered 3Q16 carries higher hopes – 11.8% sales and 6.5% EPS growth. Both seem reasonable against the 17x forward P/E. We are more concerned for longer term expectations for sales growth acceleration and expanding margins, as we see hard times in 2017 for television advertising, faster than expected deterioration in PayTV subs, and, eventually, real pressure on residential broadband from wireless alternatives. DIS – Movie franchises help, ESPN hurts. DIS shares are off almost 2% YTD as concerns for the declining subs at the hyper profitable ESPN have offset strong performances by the company’s tent pole movie franchises. This quarter will have “Finding Dory” and “Captain America: Civil War” making up for the disappointing “The BFG”, and the opening of Shanghai Disneyland distracting from alligator attacks in Orlando. We suspect that the company can achieve expectations for 8.2% 2Q16 sales and 11.2% EPS growth, but note that further declines in ESPN subs and weakening TV ad sales could still scuttle the ship. We dropped DIS from our model portfolio at the start of the year for this reason. IBM – Watson is the silver lining in a dark cloud. IBM posted a beat in 2Q16, though sales were down for the 17th consecutive quarter combined with a double digit drop in net profits. The -2.7% YoY drop in sales and -25% drop in EPS materialized largely as expected. The Cognitive Solutions segment, which includes Watson, was the only growth area for the company up 3.5% to $4.7B. Despite downbeat reactions by analysts, IBM is up over 16% on the year on hopes that the company’s Watson AI platform can lead the new businesses to deliver growth sooner rather than later. With a forward P/E of 11x and a forward P/S of 1.9x, Watson doesn’t have to deliver all that much as long as the rest of IBM dies slowly. NFLX – “Ungrandfathering” is painful. NFLX shares were down over -15% after hours despite posting an earnings beat and missing topline by $5M. The culprit was greater than expected churn as the company instituted a long publicized price increase, also called “ungrandfathering,” in the US, Canada, Latin America, and the UK/Ireland. NFLX delivered 160K net new US subs against expectations of 500K. International additions also came in lighter with 1.52M adds against 2.0M expected. While we still believe NFLX has plenty of runway and few streaming competitors, it will face hurdles going into the next quarter competing with live TV events like the Olympics and US Election news cycle, and investors may prefer to sit on the sidelines for now. Longer term our outlook remains positive as the company could potentially use several monetization levers including live content, ala carte PPV content, and advertising to reinvigorate growth. 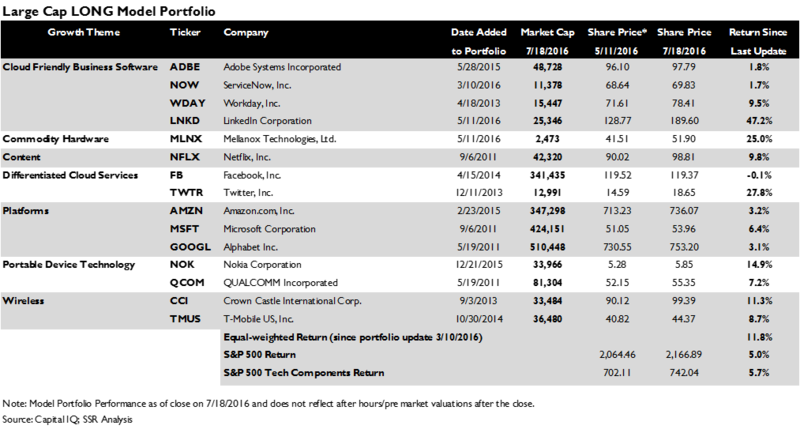 Our picks – Our long model portfolio has outperformed its benchmark by 510bp since the last update in May despite the NFLX hit, owing in no small part to the 47% jump in LNKD after the MSFT takeout agreement. We expect to perform well through earnings. 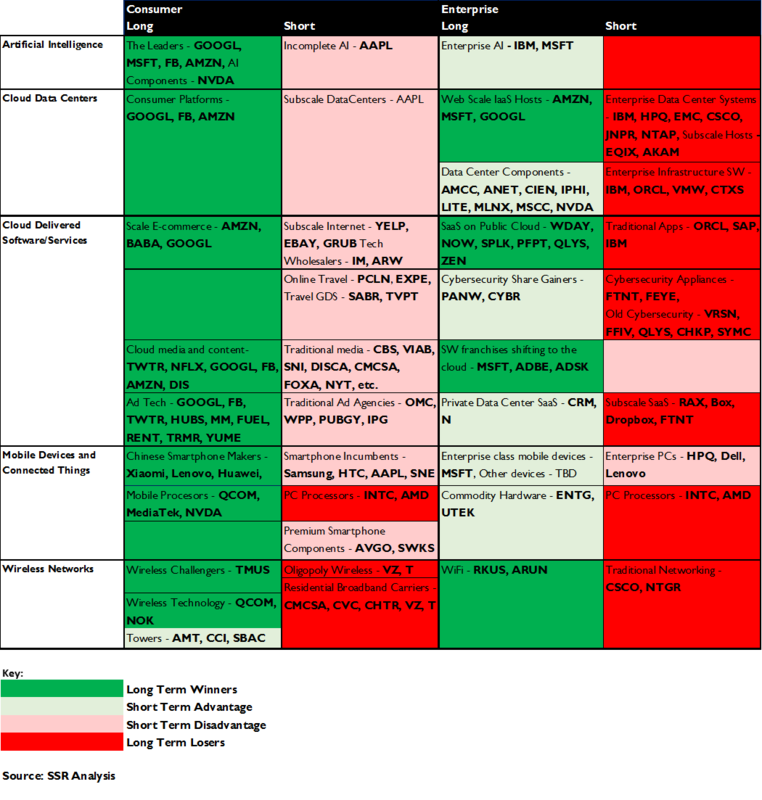 As noted above, GOOGL, MSFT, AMZN, and FB are well placed to benefit from sector themes. Results for SaaS leaders firmed up in 1Q16, and we expect ADBE, NOW and WDAY to deliver against strong sales growth expectations. MLNX has added more cloud data center operators to its customer list, as that market continues exceptional growth. TMUS and CCI have been solid stocks for us – both should continue to benefit from the overall growth in wireless data demand. Valuations are high, but expectations easily achievable. QCOM is already getting leverage from its job cuts and could show meaningful sales upside – valuation is a very pessimistic 12x forward estimates. NOK is in the middle of its integration of ALU – valuation is just 1.2x forward sales and 2Q16 numbers will be hard to parse. Finally, TWTR has shown life of late. The recent spate of time urgent news may have helped to take MAUs up – if so, this could catalyze another leg up.